Really excellent video of my friend Gabe aka Nerviswr3k- a little bit about who he is, what he's been through and what motivates him. Great, quiet insightful video. Go support Gabe by buying something from his shop here. Collaboration pieces are always great, often bringing two artists' worlds together, creating some sweet pieces. 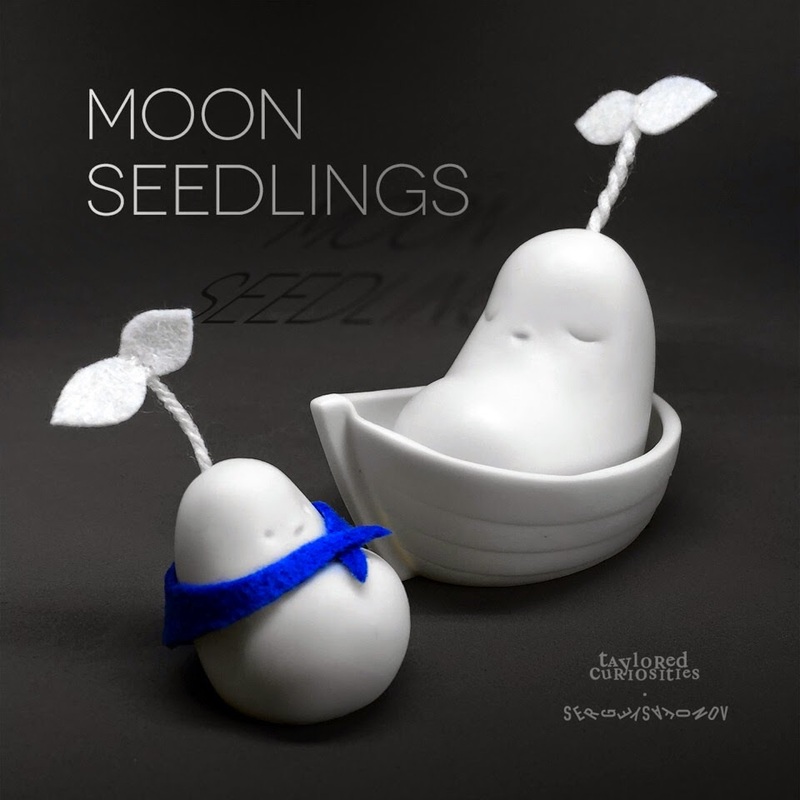 Penny, from Taylored Curiosities, recently collaborated with Sergey Safonov to create some Moon Seedlings. 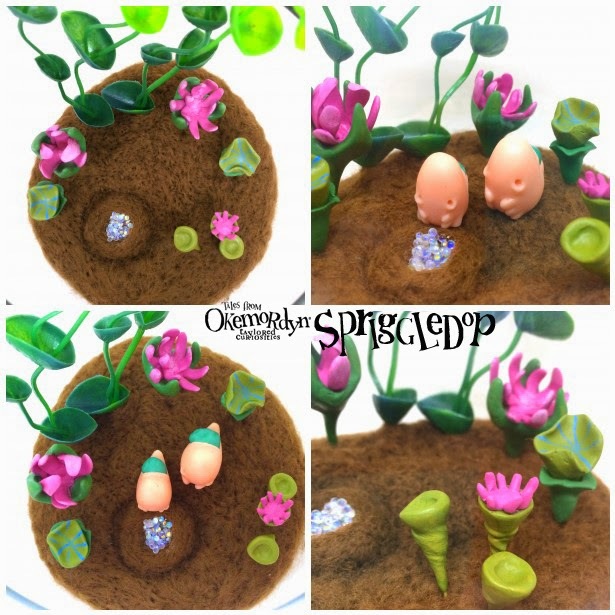 Each Seedling was hand sculpted and cast in porcelain, while being finished off with a woolen stem and a colored scarf. The larger seedling measures at a bit over 2", while the smaller Seedlings is about 1" tall. A very simple design which features some great work by two artists. Priced at 50 GBP each (~$85) plus shipping, there are 10 sets available, 5 red scarf and 5 blue scarf Seedlings. Each set comes signed and numbered out of 5. 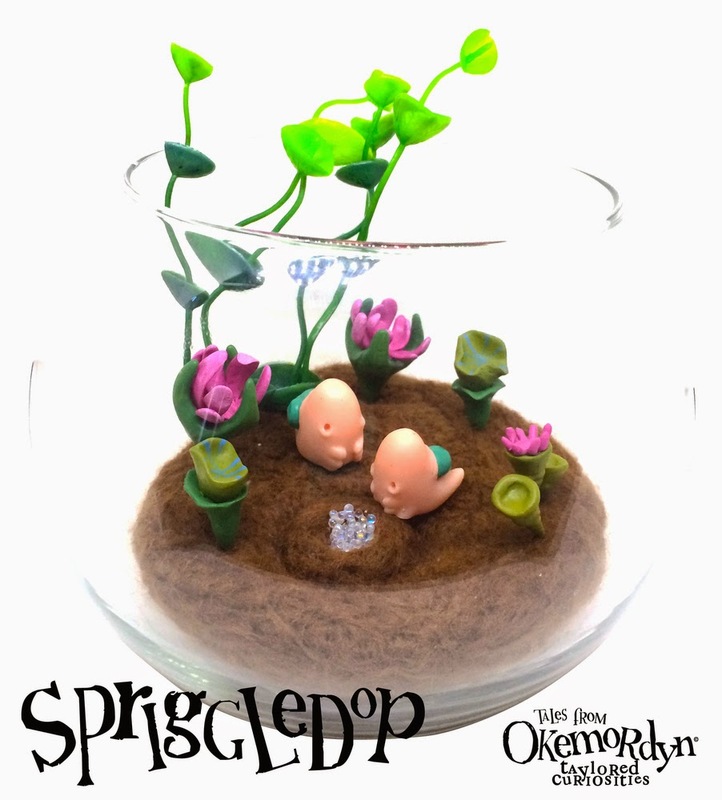 Penny, from Taylored Curiosities, recently completed a couple of terrific glass bowl terrariums, each featuring some fantastic curious creatures called Spriggledops and plants from the world of Okemodrdyn. 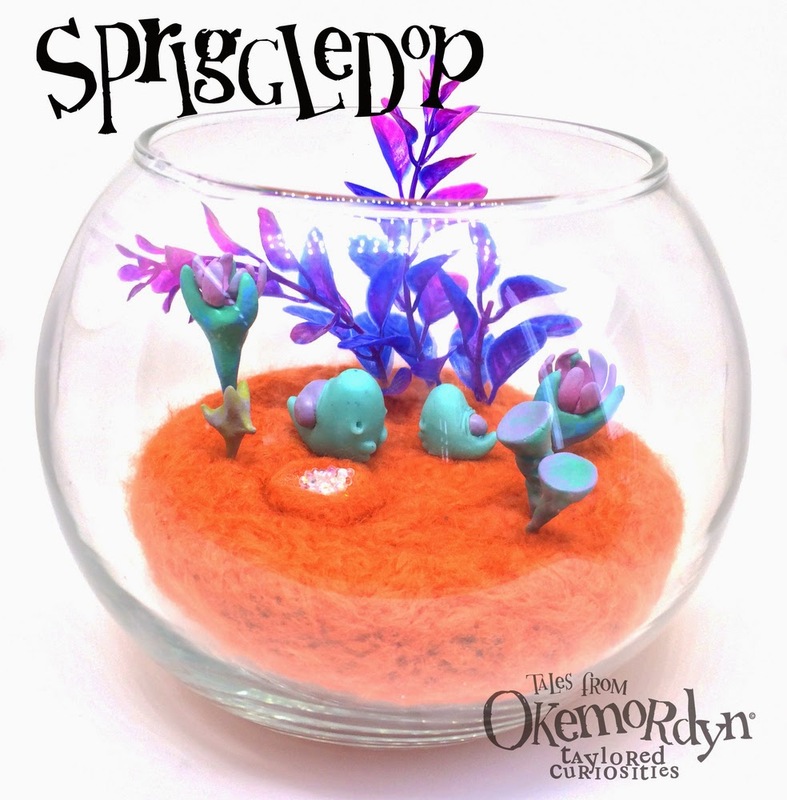 Each Spriggledop terrarium features a 4.5" x 6" glass bowl, needle felting, paint, sculpting and casting. 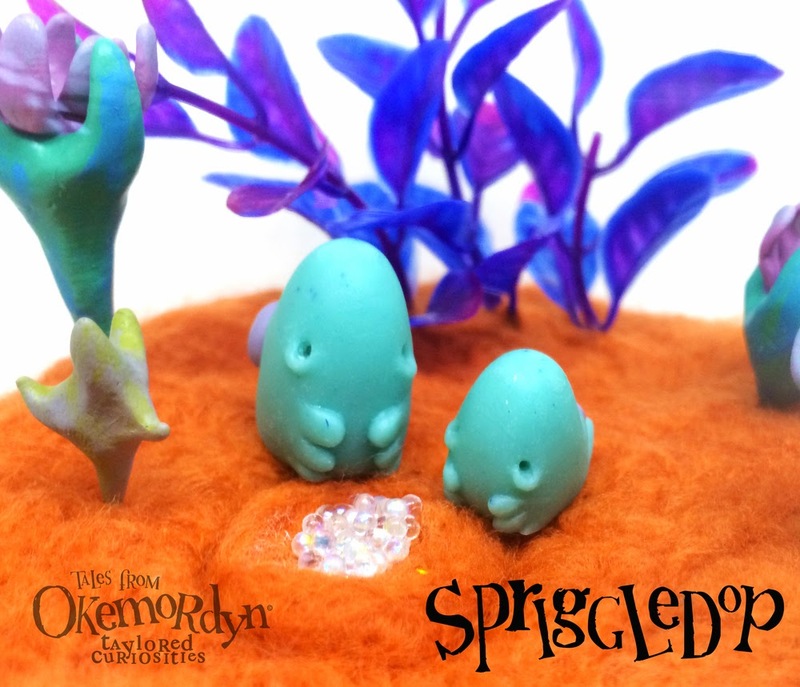 The Spriggledops are original hand sculpted creatures which can be repositioned in the terrarium, along with the plants, making each piece customizable. To start, the available color schemes include a brown with greens terrarium and a brighter orange with purple terrarium, each for sale now for 50 GBP( ~$85). To make things even better, custom color schemes can be requested via email, through the Taylored Curiosities website. Here are Shadoe Delgado's 2nd and 3rd week's commissions.The first 3 peices are "Shadowboss and minions (redux)." 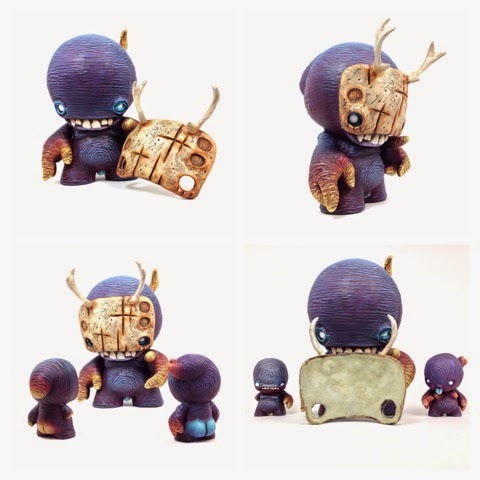 The figures are customized around a 7" Munny (Shadowboss) and two Micro Munny Shadowling repaints. The Mask on the Boss is removable and attaches using magnets with a layer of thin leather protecting the the face of the figure from any scratches. 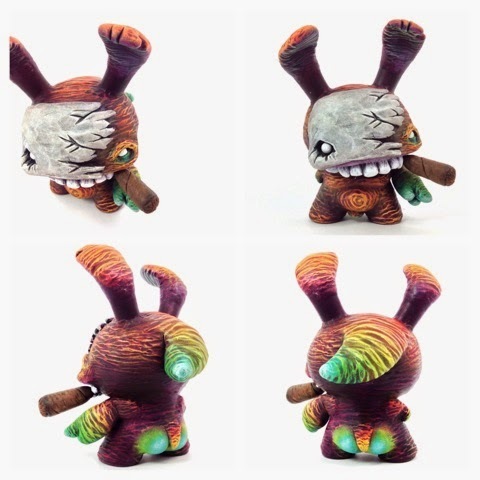 The second commission is the "(Fractured)Shadowlapin" 3" Dunny Shadowlapin with a broken mask and removable cigar. Right now Shadoe Delgado has positions available for custom commissions from December 2014 to the end of May 2015. No platform is off limits. He has also re-introduced gift certificates into his Shop for $50 and $100 or if you like he can create a certificate for a specific amount. All inquires regarding commissions and gift card amounts can be sent to ShadoeDelgado@gmail.com or you can contact him using the Form at the bottom of his Comissions page. 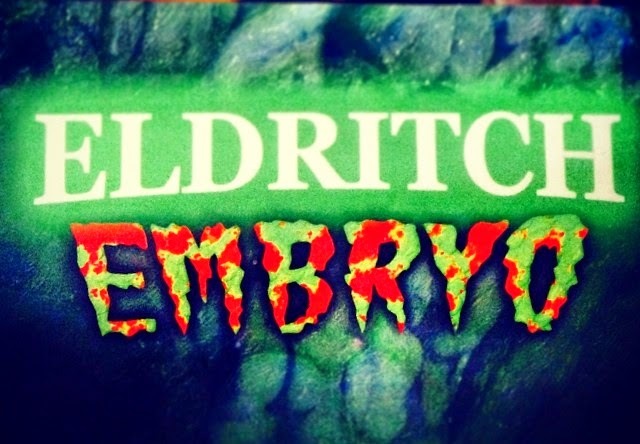 A mess of evil and eyeballs, the Eldritch Embryos are here! The future of our dimension may depend on you purchasing and destroying one of these evil little bundles of potential before they can reach maturity. Or keep them around and suffer their influence upon your every action, and the inevitable deterioration of your mind. There are 10 in this first batch and no more than 50 will be made overall. They come in an assortment of random colors (GID/clear/glitter/????) and are hand cast and articulated (at 'neck'). 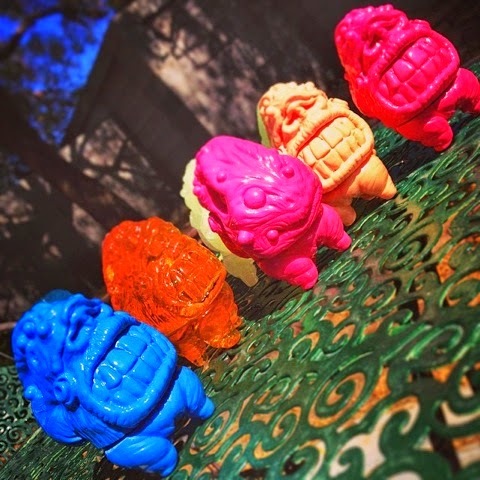 They stand 3.5 inches tall and are cast in resin. 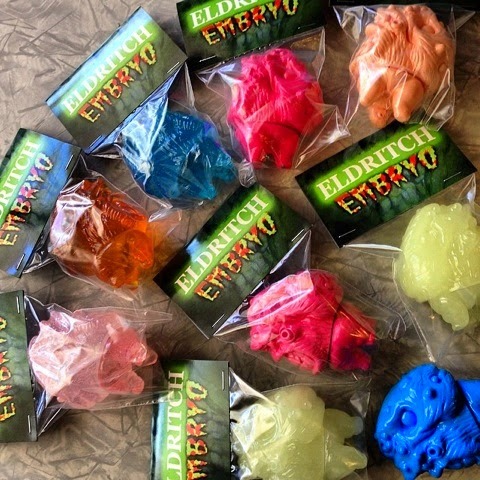 These are definitely not for children and are available now for $28 a piece at We Become Monster's webstore. All orders get a free micro SLAB, stickers, (while supplies last) and entered for random drawings to get a full size WBM SLAB. SLABs are the waste reduction program that turns waste resin into art. Liking their facebook also adds another chance for a large size SLAB. Can I be a tad bit excited about this.................! ARH Studios have the licence to officially make a 1/4 scale statue of Frazetta's famous Death Dealer. What you see above is an early work in progress. I'm sure there are many Frank Frazetta fans out there, his influence on many people is huge and I for one can't wait to see the finished product. Very early stages at the moment but as always, any news I will let you know. For the month of June, Zukaty Art Studio is offering a massive 20% discount on everything in their online store. All you have to do is use the code zukaty20 when checking out. In addition to that they are also giving away three customs. 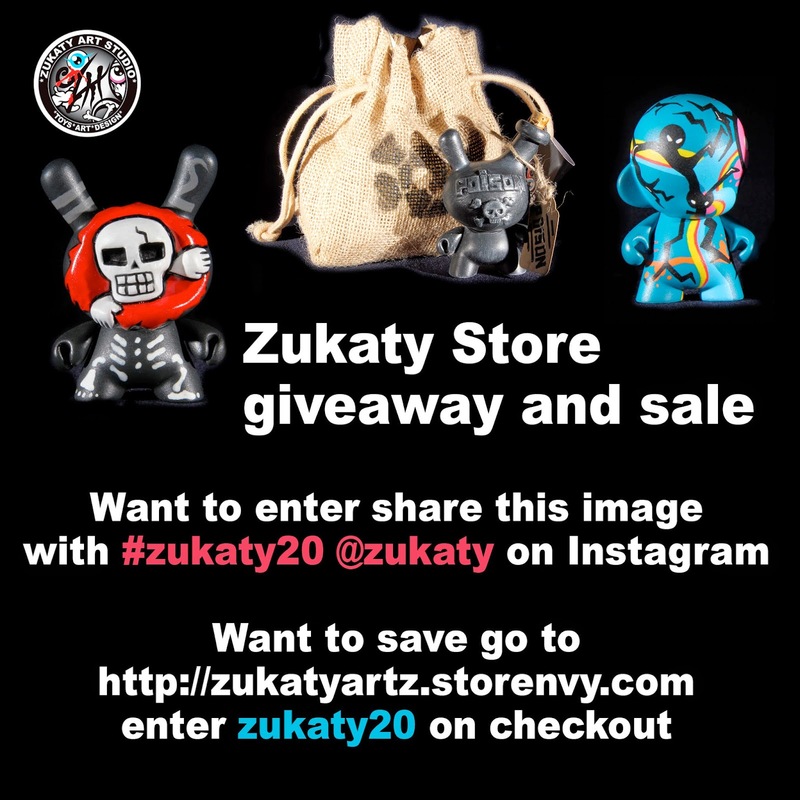 All you have to do is share the image below on Instagram @zukaty with the tag #zukaty20. You are allowed one entry per day and the contest ends on June 20th. They will announce the winners on June 21st. For all the latest news on Zukaty Art Studio, follow their new blog. If you've been on any social media outlet in the past month or so, you have no doubt seen at least one custom vampire Blood Droplet work in process post. I mean, just look at the list of talent of up there! 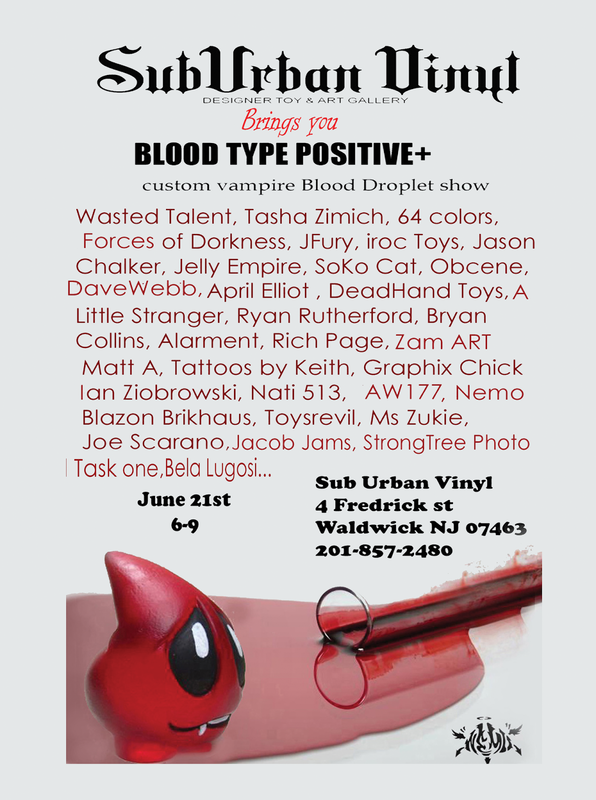 If you're in or around New Jersey this Saturday, June 21st, then you must stop by Sub Urban Vinyl from 6 to 9pm and see the amazing spins these artists have put on Nemo's Droplet! 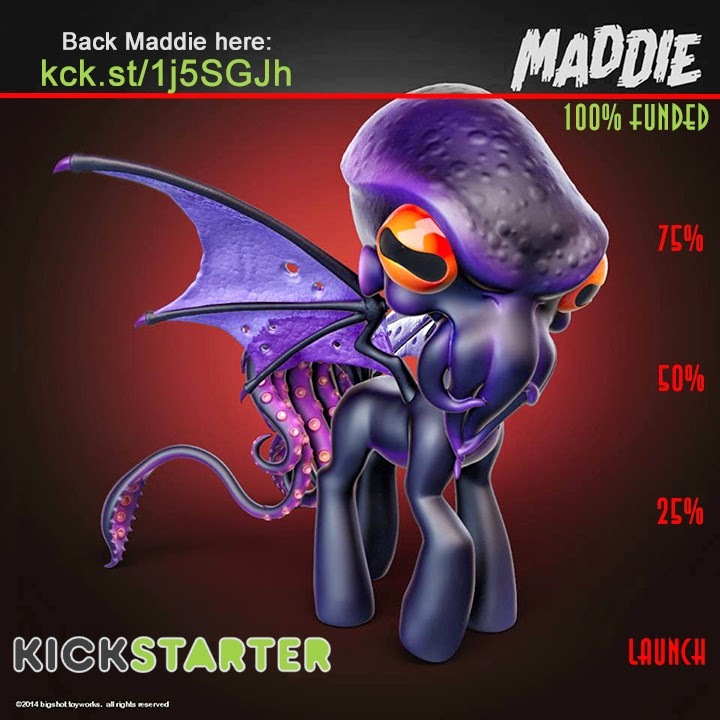 The handy style chart above will help you make your purchasing decision with regard to our newest rewards in the Little Maddie Kickstarter- only 3 days left in this campaign so not much time to get your pledges in! Click here to visit the Kickstarter and pledge. 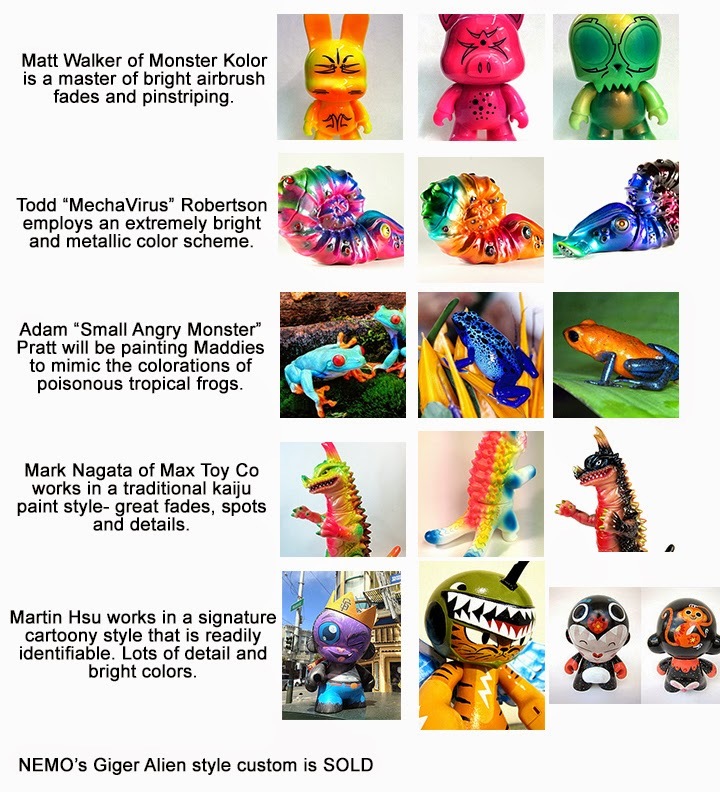 We have customs available from Mark Nagata, Martin Hsu, MechaVirus, Monster Kolor and Small Angry Monster. NEMO's contribution has already been purchased! 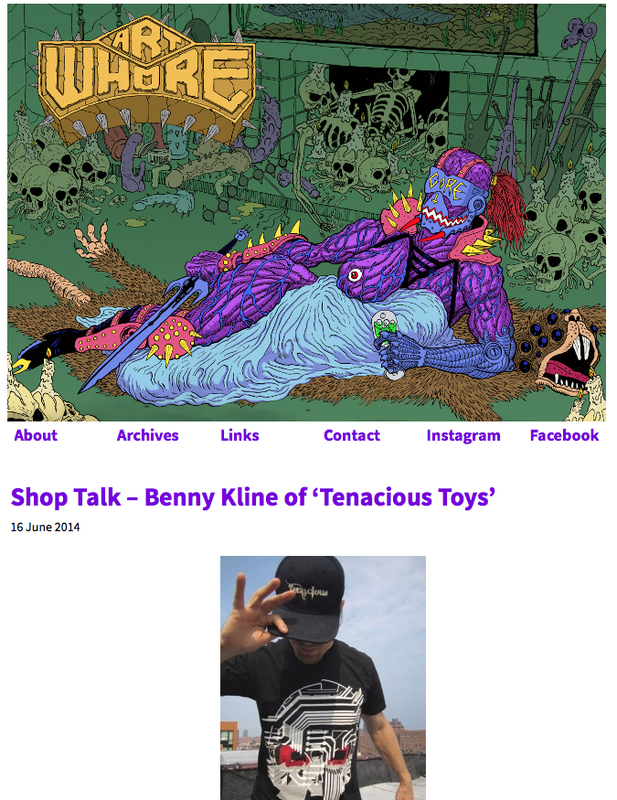 Pretty sweet interview of yours truly on the Art Whore site. Click the link below to read! I reveal all!